Galleries are in London unless otherwise indicated. Doré Galleries, 'Vorticist Exhibition. The Vorticist Group: The First Exhibition of the Vorticist Group', 10 JuneJuly 1915 (four paintings  Overbacks, Two-step, Jeu and Theatre  and two drawings: Drawing and Theatre. It is likely that the untitled drawing was the study for The Dancers 191314 (also known as The Dance), as this was selected by Ezra Pound to be sent to America for John Quinn's Vorticist exhibition in New York in 1917 (Vivien Greene, 'Ezra Pound and John Quinn: The 1917 Penguin Club Exhibition 1917', in The Vorticists (London: Tate, 2011)). 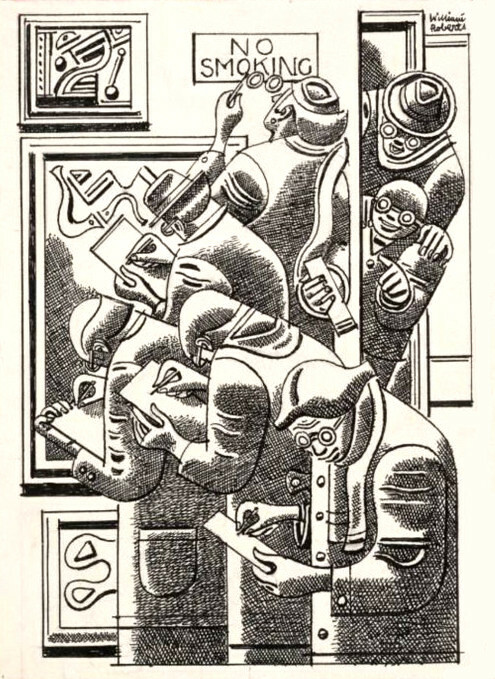 In his Some Early Abstract and Cubist Work (1957), William Roberts notes that 'Several paintings, including The Draughts Players and The Party, shown with the Vorticists at the Doré Galleries and afterwards bought by John Quinn of New York, were somehow destroyed in America' (p. 8) . Elsewhere Roberts suggests that The Draughts Players was probably a study for Jeu. No work was exhibited at the Doré Galleries or in New York under the title The Party. It is possible that this is an alternative title used by Roberts for the work known as The Dancers. New York, Penguin Club, 'Exhibition of the Vorticists', 10 Jan.1 Feb. 1917 (two paintings  Jen (later corrected by Quinn to Jeu, the title under which it was exhibited at the Doré Galleries in 1915) and Overbacks  and two drawings: Religion and Dancer). All four works were selected by Ezra Pound in London and purchased by John Quinn (two initially and two after the exhibition closed) and became part of Quinn's collection. Quinn died in 1924, and his collection was sold in 1927 (Vivien Greene, 'Ezra Pound and John Quinn: The 1917 Penguin Club Exhibition 1917', in The Vorticists (London: Tate, 2011)). Northampton, Gallery 27, 'William Roberts R.A.' 324 July 1971 (18 works on paper from the Hamet Gallery show above). Ben Uri Gallery, '"Uproar! ": The First 50 Years of the London Group', 31 Oct. 20132 Mar. 2014 (At the Hippodrome).